Monday's visit is one I had to keep secret as it was a birthday treat for one of my closest friends. 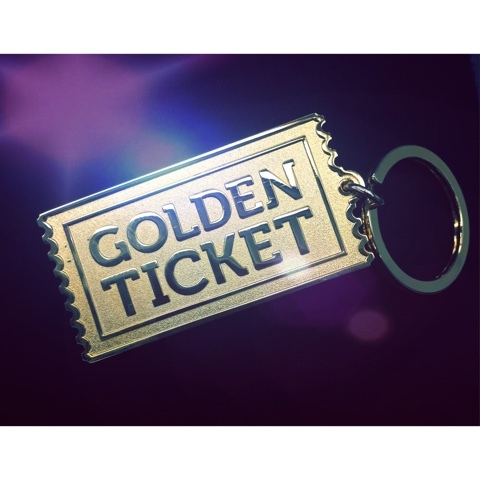 All she knew was to meet me in Covent Garden when she was given her golden ticket for the visit. I did want to hand it over in a Wonka chocolate bar but was gutted to find they don't make them anymore. On arrival at the theatre we were greated by the lovely staff in the foyer. From having tickets checked to being served for some sweets everyone had a smile. From both my visits to the show I highly rate the Theatre Royal in my top 5 favourite theatres. It's a stunning theatre both inside and out and is a lovely experience from start to finish. Bonus points always awarded for the leg room around the seats. On my last visit I was quite high up but this time row D in the stalls bought a complete new love for the show. I didn't realise how much detail I had missed before but really enjoyed the whole performance. The stage set from our view I thought was very clever I picked up on a lot more this time round. With out giving away spoilers if you haven't seen the show already - Pure imagination will firstly bring goosebumps and secondly the emotions. It's beautifully done and also very cleverly shown. Completely my favourite part of the show. Special mention for the cast - from start to finish they were all brilliant. I don't know if it was from being so close but I actually found Mr Wonka a bit scary during the first half but warmed to him more during the second half. The show is one id recommend you to add to your list to see for 2016 for viewers young n old the magic will take you in from the moment you enter the theatre.